At present it is possible to travel freely over land between the Myanmar borders with Thailand and India. The border crossing with Laos is remote and permission to cross remains uncertain, and the borders with both Bangladesh and China are closed to foreigners. More information on individual crossing points and obtaining permits is provided below (rules apply the same crossing in both directions), and you can click on the map on this page to see crossing locations. Myanmar's simple e-visa system is valid at the two Indian-Myanmar border points and all Thai-Myanmar border points except Htee Kee/Phunaron, for which you must obtain a normal paper visa beforehand. For information on vehicular crossings, go to the bottom of this page. Four Thai/Myanmar border points are officially open to foreigners for through travel, and Thailand offers visa-free travel for the citizens of many countries; the length of the stay period depends on what country you are from – varying from 14 days to 3 months. Check here for more details. The Mae Sot (Thailand, Tak Province) / Myawaddy (Myanmar, Kayin State) crossing point is the most practical place to cross for onward travel into Myanmar, because of its relative proximity to the main Myanmar transport network and places of interest such as Mount Kyaiktiyo (the Golden Rock), Hpa An and Mawlamyine. At the passport control points (located on either side of the ‘Thai-Myanmar Friendship Bridge’ river crossing), there are separate windows for foreigners – you do not have to stand in the same (sometimes long) line as the locals. The border point is located about one kilometre from Myawaddy bus station on the Myanmar side and five kilometres from Mae Sot town on the Thai side; there are usually plenty of motorbike taxis on both sides. Mae Sot has daily direct flights and frequent buses to Bangkok and Chiang Mai. On the Myanmar side, the new road over the Dawna mountains - connecting Myawaddy to the rest of Myanmar - is now open (so you do not need to worry about the issue of the old single track road, with its alternating one-way system). Take a look at our YouTube video from the Myanmar-Thailand border at Myawaddy-Mae Sot. Foreigners can cross the border at Mae Sai (Thailand, Chiang Rai Province) / Tachileik (Myanmar, Shan State) and travel as far as Kyaing Tong in Myanmar; to travel over land further than this you will need a permit (find out more by contacting us here). 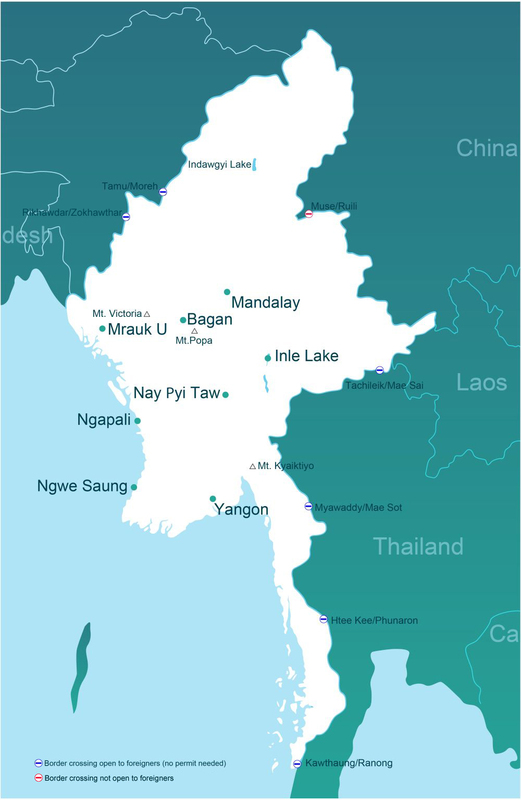 Kyaing Tong and Tachileik have airports with internal flight connections to Mandalay, Yangon and Heho (for Inle Lake, Kalaw and Taunggyi). Tachileik’s economy is based on cross-border trade and tourism, and Thai baht is the main currency (not Myanmar kyat). To find out more about onwards travel from Tachileik into Myanmar, go to Kyaing Tong. The crossing between Ranong (Thailand, Ranong Province) and Kawthaung (Myanmar, Tanintharyi Region) offers options for further travel in Myanmar – buses or flights on to Myeik, Dawei and north to Yangon, plus cruises to the Myeik Archipelago. You can take longtail boats between Ranong and Kawthaung, taking 25 minutes and costing 100 Bhat. In Ranong, the immigration office can be found at Saaphan Pla Pier; in Kawthaung, it can be found at the main jetty in the centre of town. Both offices are open from 7am to 5pm. Note that if you are entering Myanmar only for a Myeik Archipelago tour (not for further travel) then, depending on the length of your visit, you may not need a visa - a border crossing permit may be all that is required. If you are on a short stay or visa run from Thailand, you will not need a Myanmar visa, but you will need your passport and a copy of the photo page, plus US$10 in crisp notes for a border crossing permit. Check out our YouTube video of the boat crossing from Kawthaung to Ranong. This remote border crossing point allows access between Phunaron (Phu Nam Ron) (Thailand – nearest town Kanchanaburi) and Htee Kee (Myanmar, Tanintharyi Division – nearest town Dawei). Note that e-visa is not valid for entry at this border crossing. There are four buses per day from Kanchanaburi to the small border town of Phunaron (70 baht), which has one guest house. The Thai and Myanmar borders are separated by six kilometres of no-mans land; there are also two separate checkpoints separated by around one kilometre. You can take a motorbike taxi (around 100 baht) or try to hitchhike between these points or further afield, in either direction. From the Myanmar side of the border, it takes five hours to get to Dawei. There are usually cars or minibuses waiting, costing around K30,000 (bear in mind that if you arrive late in the day there may be no transport, and the road can become impassable during the rainy season). Travelling from Dawei to Thailand, daily minibuses to Htee Kee can be booked through most hotels and guest houses in Dawei. Known as the 'Three Pagodas Pass', the crossing at Sangkhla Buri (Thailand, Kanchanaburi Province) and Payathonzu (Myanmar, Kayin State) is not open to foreigners. The Singkhorn Pass is only open for Myanmar and Thai residents travelling either way for up to two days. It connects Mueang Prachuap Khiri Khan (Thailand) with a very remote part Myanmar's Tanintharyi Division (nearest large town Myeik, although this would take over one day's travel). There are two open border crossings connecting Myanmar and India. Both accept e-visas, require no special travel permits and are not in areas of restricted travel. In western Sagaing Division is the border crossing between Moreh (India, Manipur state) and Tamu (Myanmar, Sagaing Division). The small town of Tamu serves primarily as a transport and logistics hub for cross border trade between India and Myanmar. There is also an ATM, a variety of restaurants, and several hotels that accept foreginers. The Myanmar government opened the Zokhawthar (India, Mizoram state) and Rikhawdar (Myanmar, Chin State) border crossing to increase the trade flow to remote northwestern Chin State. That being said, this mountainous region offers incredible scenery, rugged roads, and a unique cultural experience. Just outside of Rikhawdar village is the heart-shaped Rih Lake. It is not permitted for foreigners to cross at any other India-Myanmar border points. We offer a range of overland tours to Myanmar. Speak with a travel expert or make an inqiury here. There is a Myanmar/Laos border crossing that connects Kyainglap in eastern Shan State with Xieng Kok in Luang Namtha Province; the Myanmar-Laos Friendship Bridge opened in 2015 and is the only bridge crossing the Mekong River to connect the two countries. The towns on both sides are very remote, with undeveloped infrastructure and unpaved roads. On the Myanmar side, the nearest towns to the border are Tachileik at 97km and Kyaing Tong at 164km (six hours drive); it has been announced that by authorities that the border crossing is open to foreigners, but you attempt it at your own risk! To cross the land border at Ruili (known as Shweli in Burmese and located in China’s Yunnan Province) / Muse (Myanmar, Shan State), you will need to arrange a special tour package by filling out this form; the package will include a guide and mandatory private transportation. You will need to apply at least one month in advance of your travel date. The China-Myanmar border crossing is currently totally closed for foreigners; we will update this page as soon as the situation changes. Yangon, Mandalay and Kunming all have embassies or consulates where you can apply for the relevant visa (Myanmar or Chinese). For details, go to embassies and other useful information. It is not permitted for foreigners to cross at any other China-Myanmar border points. Crossing into Myanmar with your own vehicle (motorhome, car or motorbike) requires special permission and you will have to be accompanied by a guide and sometimes a Ministry of Hotels and Tourism liaison officer. We have extensive experience in route planning, guiding, accommodation and logistics and we would be delighted to work with you on your overland Myanmar trip (permits typically take at least one month to process). Note that cycling groups also need permission for border crossings. The photo above is of a Dutch car club tour near the India-Myanmar border; Go-Myanmar.com helped the group with all their planning, permission, guiding and booking needs.